The Cupertino company has proven yet again that it doesn't need to be the most prolific phone seller to become the world's most profitable handset maker by an extremely wide margin. 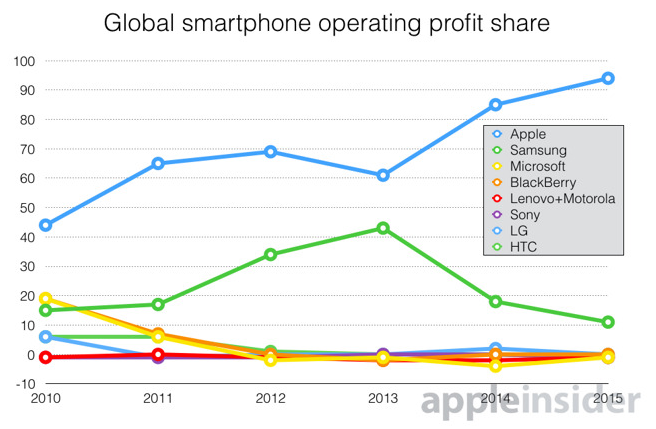 Despite selling only 48 million iPhone units in Q3 2015, which accounts for just 14.5% of all smartphones sold globally in that period, Apple was able to get a whopping 94% of the total phone industry profits -- leaving a mere morsel for competing brands to nibble on. In stark contrast, Korean Giant Samsung - which remains to be the top handset seller in the world - was able to sell a total of 81 million units accounting for 24.5% of all phones sold in the period -- and yet, the company was only able to get a measly 11% of the total operating income. For reference, the average selling price of an iPhone in Q3 2015 was $670 USD while a Galaxy handset by Samsung sold for an average of $180 USD in the same quarter. What's Apple's secret in making that much money without having to sell as many units, you ask? It's a number of factors -- but basically their main strategy is targeting the right market, selling devices at a premium, and delivering on the promise of quality. They don't sell cheap iPhones but they strive to make the product well worth every penny for the consumers. To quote Tim Cook in his interview with Fast Company earlier this year, "Steve Jobs felt that if our company could make great products and great tools for people, they in turn would do great things. He felt strongly that this would be his contribution to the world at large. We still very much believe that. That’s still the core of this company." You can't argue with success, so they say. And if we were to consider how profitable Apple has become within the last five years, it's hard to question the value of that overarching corporate vision.